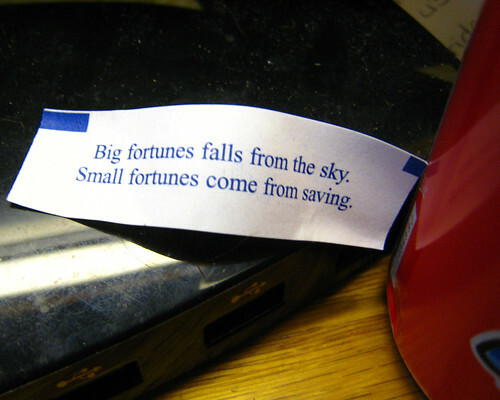 Big Fortunes Falls From The Sky. Small Fortunes Come From Saving. Looking at this fortune for today’s FortunateBluFrog.com post, the first thing that comes to mind is that when a fortune is not earned it can be lost easily. However, the fortune says nothing about losing a fortune or earning one either. That is pretty much my interpretation of the word falls where I think it would be more grammatically correct if the word was fall. Suffice to say I’m just not quite feeling it today. To me earning a fortune a little at a time is more important than having one dropped in your lap. Sure I’d love to win the lottery and you won’t see me giving the money away. However, there is something to be said for earning your money, knowing where it came from and having worked for it. It is like falling into a job that you have no business doing, you didn’t work your way up getting to know the business or even what your current job entails. But if you start at the bottom, learn the business, how it works and how to improve it you should succeed. Learn the ropes. You won’t start at the top no matter how many get rich blogs you read. You’re not going to amass a huge with little to no work. Not Ga Na Happen. Work hard, make progress each day and you’ll attain success. True.. very true Fortune comes from your own hands. There’s no such thing as fortune falls from the sky. This are just illusion. Exactly Nix, you gotta work hard for the money. Welcome to my blog. hmmm , , , i got this fortune in a cookie the other day. it was something i had already been thinking about, and since i have a fortune cookie spirituality, i took it very seriously. , , , i was trying to think of the exact phrase to write in my personal files, and came across your blog. i plan on reading more . . . Thanks for the great comments, I did a few fortune cookie posts over the course of a month. Hope you like them.